Pioneer Drive upgrade is almost done! 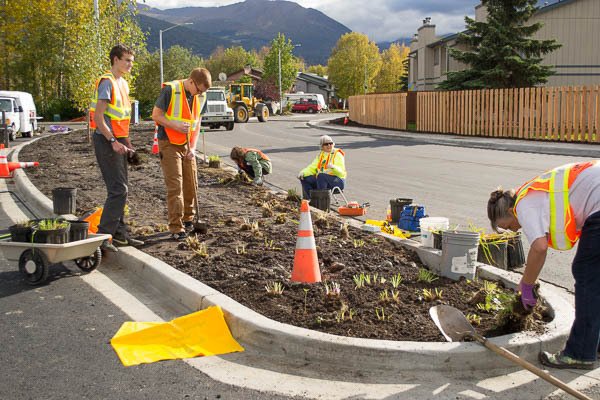 The irises rescued from Pioneer Drive median last May have been planted in new flower beds along the front of Chugach Foothills Park by volunteers this week. The Pioneer Drive upgrade is almost done! It’s beautiful! OPINION: “Muldoon has waited long enough for a first-rate park of its own, so spare us the sprawl and give us the space,” columnist Mike Dingman wrote in Alaska Dispatch News on September 23. Dingman: Muldoon needs a park, not another strip mall. Though he named the two Muldoon area community councils as Northeast and Chester Creek (instead of Scenic Foothills), Dingman makes a good case for dedicating all 29 acres of the old Alaska Greenhouse property on the east side of Muldoon Road at DeBarr as a Muldoon Park Strip / Muldoon Town Square Park. A public hearing on the Chugach State Park Access Draft Plan has been continued to March 2015, before the Anchorage Assembly. You are encouraged to take advantage of this opportunity to provide your perspective on preserving access to Chugach State Park. Click here for more information about the plan. Scenic Foothills Community Council meets at 7 p.m. Thursday, October 2, at Wayland Baptist University, 7801 East 32nd Avenue (access via Old Muldoon Road off 36th Avenue). We will have a Legislative Candidates Forum for Senate House District 27 (Matt Moore / Lance Pruitt). Because of the contemporaneous HALO meeting, the Senate candidates will not be at our forum. Proposed bylaws, as mandated by the Anchorage Assembly, will be introduced for discussion at the November meeting. Click this newsletter link for more details. 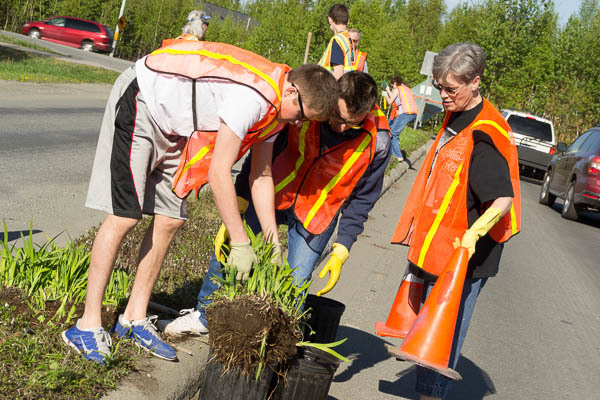 Pioneer Drive Iris planting 2 p.m.-3:30 p.m. Sunday, September 21, at entrance to Chugach Foothills Park. We are looking for a few volunteers to plant irises rescued prior to the Pioneer Drive upgrade last May. The new beds at the edge of the park got topsoil on Friday; now the irises depend on us to get their roots into dirt before freeze-up. If you can help, just show up. Bring gloves. We’ll have hand tools or bring your own. –Michele Pamer and Jerrianne Lowther, volunteer coordinators. Trevor Cole, Lucamaria Casagrande, Gwen Crawford; in back, Michele Pamer, Brian, Jim & Ruth Durr rescuing irises, Pioneer Drive in May.